Bake some Pink Cupcakes for your friends and family using these cupcake wrappers and cupcake toppers for Breast Cancer Awareness Month this October. Send me your pictures and I will post them each week in my blog! Print these on full sheet label paper or run them through a sticker machine. 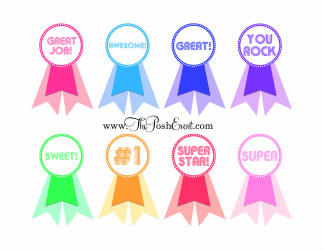 Show how proud you are of your special one!! Hey, put one on yourself too! Who says that you can't print money! Ok, don't go out in public with these in your wallet, but have a great time at home with the kids! This is a great way to teach your kids math and working with money. 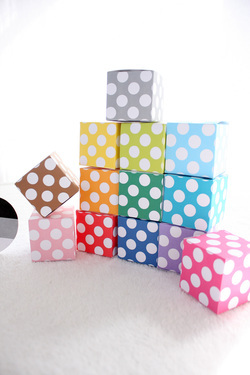 Just print, cut, and play! Have at little more fun this St. Patrick's Day with these printable clover glasses. Download the above file, print and cut out. You can adjust the holes and the glasses arms to fit. I suggest using a hobby knife to cut out the inner circle. 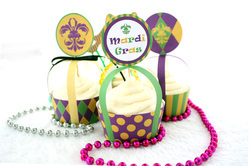 Make this Mardi Gras even more Posh with this free printable cupcake wrapper! Cut out the wrapper then punch a hole on each trellis. Cut out cupcake topper and place on a toothpick or lollipop stick with tape. Thread the cupcake topper through the holes of the trellis and secure into the cupcake. Place out for all to enjoy! The rest of the set is available at the Etsy Store! A fun project for kids where they can learn what the different colors of a stop sign stand for. Or just use it as a game Stop and Go! Download the two files put the yellow cover on top and cut out together. Cut out the doors on the cover and glue together leaving the doors open. Use this card to help take better pictures.